Have you found chewing gum stuck on your favorite leather item? Do your kids dispose of their chewing gum inside the seats of your leather couch? Afraid chewing gum stains have ruined your leather forever? No need to panic, you won’t even have to throw out your favorite furniture or send your stuff to the cleaners — no matter where the chewing gum might be you can learn how to remove gum from leather safely. Leather is one of the last places you want to find old, chewed up gum. The good news is that chewing gum generally won’t stick to leather unless it has been pressed down onto the leather or has melted onto the leather. The bad news is that once it has been pressed or melted on removing it can be tricky. To safely get gum off leather with ice you need to place the ice cube in a plastic bag to prevent water damage from drips as the ice melts. Slowly rub the ice on the gum. The ice hardens the gum allowing you to chip it away. Once the gum has hardened use something with a hard, flat edge to chip the chewing gum away from the leather. Items that are a good choice include a butter knife or a credit card; you can even use a fingernail. Avoid anything sharp as you increase the risk of gouging the leather. Use a damp, clean rag to apply a small amount of saddle soap to the affected area. Rub until you have created a light lather. Using circular motions, you can use the saddle soap to remove any gum remnants still stuck to the leather. If the cloth isn’t removing the pieces, you can use a soft toothbrush. Use a second clean, damp cloth and wipe off the saddle soap. Do not use water to rinse the saddle soap away as it can ruin the leather. Once the spot has dried use leather conditioner to prevent any discoloration. With your hair dryer on high heat point the nozzle at the gum on the leather. Using a circular motion heat until it becomes soft. Use a hard-edged scraper to scrape off as much as you can. You can also use a butter knife, spatula, or old credit card. Reheat the leftover gum with the hair dryer until soft. Use a clean, dry cloth and rub in a circular motion. The remaining gum will form into little balls that are easy to wipe away. Wipe down the stain with leather cleaner to remove the greasy residue left behind. Apply a leather conditioner to the areas you applied heat this will moisturize the area. Soap suds applied to gum work to loosen the fibers of to help safely remove it from leather seats or other items. Sponges or toothbrushes can help further loosen any leftover particles. Use a spatula, plastic scraper, credit card, or even a butter knife carefully scrape off as much gum as possible, but do not scrape the leather. Mix some leather soap with lukewarm water and mix until a thick foam has formed. Use a sponge to gently rub the suds from the foam into the remaining gum stain. Continue rubbing until you remove all the remnants. Dry with a soft cloth and apply leather conditioner to restore any discoloration. Use a thin hard-edged tool, such as a butter knife or old credit card, to scrape away as much gum as you can. For gum removal, mix the peanut butter well, so the peanut oil is thoroughly incorporated into the solid butter. Some peanut butter will ruin leather so always test a small amount in an inconspicuous area. After about an hour wipe away the peanut butter and apply some leather conditioner. Do not use peanut butter if an oil stain was left behind. If the test worked, spread only enough peanut butter to cover the gum. Allow the peanut butter to sit for a few hours to break down the fibers for easy gum removal. Use a damp, clean towel to wipe away both the peanut butter and the gum. If any gum remains use saddle soap and a clean cloth to get rid of the remnants. Once the area has dried apply leather conditioner to restore the leather. Scotch tape is an excellent way to clean car upholstery as it doesn’t have any risk of leaving behind unwanted stains. Using scotch tape or another extremely sticky tape, press the tape firmly onto the gum multiple times. Pull the tape and gum off. If the tape is not working, use an adhesive remover, such as Goo Gone, to safely remove the gum from your car upholstery. Once all of it has been removed use a leather conditioner on your car seats to restore any damage to the affected area. Soap suds and vegetable oil work to break down and loosen gum fibers to aid in its removal. Use vegetable oil should only if the soap suds are unable to remove the gum entirely. Carefully remove any gum that you can with a plastic scraper or credit card. Mix a mild soap and water to create soapy water with plenty of suds. Apply the mixture to the leather with a soft cloth and then wipe away with clean water. Dry the spot with a paper towel or clean cloth. If the gum is gone no further cleaning is required, merely apply leather conditioner. If gum remains, you need to apply a small amount of vegetable oil with a clean cloth. Rub the vegetable oil into the gum in a circular motion and allow to sit for one minute. Wipe away the oil with a clean towel to remove any excess. Follow up with a leather conditioner to fully restore your leather. 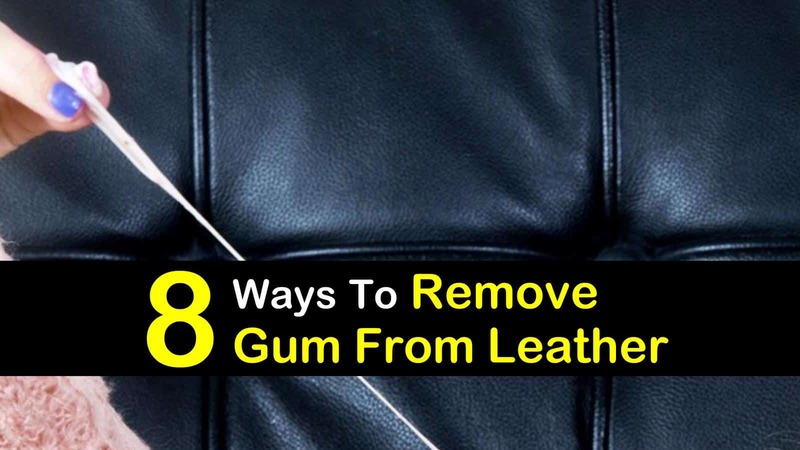 Removing gum from your favorite leather jacket requires a few extra steps. First, freeze the gum with ice and scrape off as much as possible. Use a towel to brush off as many loose particles as possible. Apply dry cleaning fluid to the stain and let it sit for a minute. Apply a piece of tape to the gum and gently pull off to remove any excess. Repeat with a new piece of tape as many times as needed to remove the remaining gum. Use a leather conditioner and allow to air dry. WD40 works similar to ice, as it “freezes” the gum making it easier to remove. After spraying WD40 use a butter knife or other flat edged tool to scrape off the chewing gum. Wash the area with one of our leather purse cleaner recipes to remove any residue left behind. When learning how to remove gum from leather, it’s a matter of trial and error. Some methods will work better than others on certain items. If a specific technique doesn’t work, try a different one or a combination of methods to remove chewing gum from leather effectively. Thank you for taking the time to read through this article on how to remove gum from leather. If you found even one of these gum removal methods helpful, please take a minute to share these gum removal tips on Pinterest or Facebook so that others may also benefit.